Weekly Photo Challenge: Abandoned | Oh, the Places We See . . .
Only a month ago, we had a couple of days in Boise, Idaho, with no plans. So we decided to head up to McCall to see the resort we’d heard so much about. 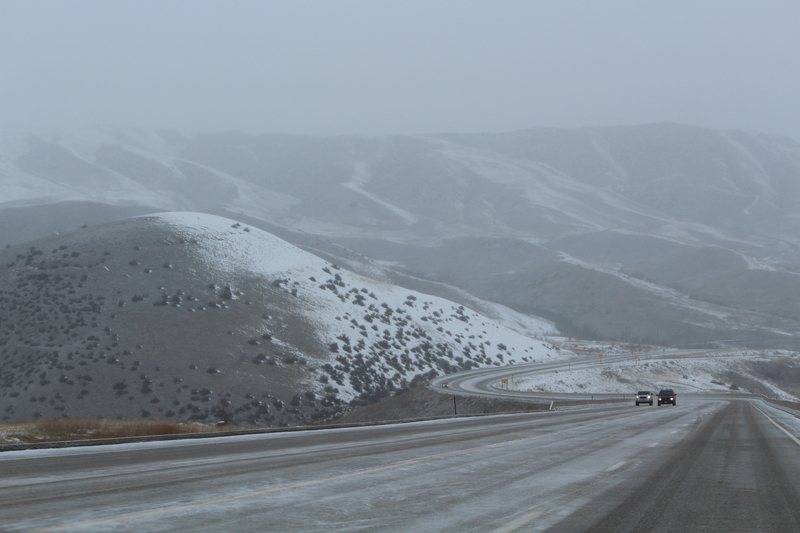 On the morning of our departure, however, Mother Nature showered Boise with snow, and there were times when we questioned the sanity of traveling north along Idaho Hwy. 55 with almost no one in sight. The rewards, however, of seeing forests, farms, and streams covered with snow far outweighed our initial question of What are we thinking — traveling to McCall in a state we hardly know and in a car we’d only rented the day before? A few of the abandoned structures — aging, dilapidated, empty — reassured us that we had done the right thing. Where else and when else would we see such a contrast of abandoned buildings with fresh, untouched snow? For more pictures of this week’s Weekly Photo Challenge: Abandoned, click here. We’d love to have you follow our blog. Just click on the button in the right column above. And, oh, the places you’ll see right along with us! This entry was posted in Idaho, Photography, Travel, Weekly Photo Challenge and tagged abandoned, barns, farm, Hwy 55, Idaho, McCall Idaho. Bookmark the permalink. Maybe those roads are why there are so many falling-down barns! ;oP So glad you braved the slick roads, tho. Those pictures paid off! Thanks! Sometimes you just have to go somewhere on the designated day because you might not get back there! Thanks, as always, for reading and commenting! Very very nice! Piggletino shall ask his scout for a little fur coat before heading out! 🙂 Thank you for sharing these awesome photos! Piggletino would need snow shoes also! It was so pretty along that highway, and the abandoned barns really stood out against the pristine snow! Thanks for reading! Love that last shot with the pale blue sky, the muted shades are wonderful together. The first photo would definitely have made ME turn around tho!! We were pretty scared not knowing the way or what we would face. But you only have a few shots at seeing something different, so we took that chance. It all worked out! Thanks for reading! I love McCall, it is one of my favorite places to visit when we are in southern Idaho. My parents are in Boise, so McCall makes for a nice day trip. Beautiful photographs! I am so glad we went. It was a beautiful trip and even more beautiful once we got there. I know now why it’s such a popular resort destination. Anywhere else you recommend? I’m going back to Boise tomorrow. Will take my husband to Idaho City for a day. great collection of images for the theme! love those barns. Thanks. I love barns, too. Even abandoned ones. We questioned our sanity also, but I have to hand it to the Idaho Dept. of Transportation. Those curvy roads were clear in no time. And when I mentioned my hesitation to return the next morning, the people in the McCall restaurant looked at me as if I were a foreigner! Imagine that. They just take off in any kind of weather! You just come right on over to the States! We’ve got lots of photo ops and tourist spots!!!! And then I’m going back with you to take pics of your favorite spots!!! Great images, Rusha! I love coming across images unexpectedly like you did here! Me, too! Most of these pics were taken from inside our warm car. But I wish I could have gotten closer. Not sure how the farm owners would have felt, however, seeing someone coming through the snow to take pics of an abandoned building!!! But don’t you always find it’s the way? We regret what we didn’t do….I wish I had had a torch at the old Maginot fort…I got inside, but no more than a few paces as it would have been to dangerous to continue, unseeing. These barns look so sad in the winter… Great photos, Rusha! It’s beautiful – but it sure looks cold. Brrr!